Tankards has several long scratches and a little wear to label, will need a good clean. Nicely cut crystal tankard which stands 10.5 cm high. It's a really nice piece. Presented in a silver folding box, all you need to do is add the wrapping paper! We can Laser Engrave your Tankard with up to4 Lines of text and 20 Characters per line, Including spaces and punctuation. 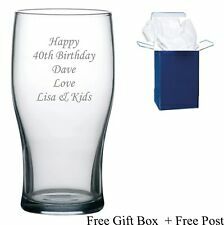 Made from high quality resin with a stainless steel cup insert. Stylish Kraken rum mug x 2. Sheffield Pewter 1 Pint Beer Tankard Celtic Theme Signed "Veech"
Sheffield Pewter 1 Pint Beer Tankard . Unusual shape, very good condition. party drinking vessel (glass) machine gun shaped. party drinking vessel (glass) machine gun shaped.. Condition is Used. Dispatched with Royal Mail 2nd Class.great party piece. Lovely vintage stoneware tankard in a dark mottled blue paint effect in great condition. Unknown make. New listingSilver and horn drinking flask *Game of Thrones* inspired! Silver And Horn drinking Flask. Condition is Used. Dispatched with Royal Mail 1st Class. Here we have a lovely engraved stainless steel tankard. It is supplied in standard cardboard box. 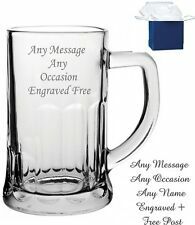 We can engrave any text up to 15 words below the logo onto the Tankard. Text will be laid out to suit the item at engravers discretion. THIS GORGEOUS PEWTER GILL TANKARD IS MADE IN THE TYPICAL TANKARD SHAPE WITH A BULBOUS BODY AND RIBBED FOOT. THE HANDLE IS STYLISH AND FASHIONED. Antique 20th Century Italian Royal provinace solid silver photograph frame, particularly large, the top applied with a crown, mounted on a wood and fabric bound back with easel support and glass to protect the photo. The photograph is dipicting Elena of Montenegro, or more commonly known as Queen Elena of Italy (8 January 1871 – 28 November 1952) nicknamed "Jela" was the daughter of King Nicholas I of Montenegro and his wife, Milena Vukotić. she was Queen of Italy from 1900 until 1946 and Queen consort of the Albanians from 1939 until 1943. On 29 July 1900, following his father's assassination, Victor Emmanuel ascended the Italian throne. Officially, Elena assumed her husband's whole titles: she became Queen of Italy, and with the birth of the Italian Colonial Empire she became Queen of Albania and Empress of Ethiopia. MADE IN A TRADITIONAL TANKARD STYLE WITH A STYLISH HANDLE AND ALL THE APPROPRIATE MARKINGS YOU CANNOT HELP BUT WONDER WHAT SIGHTS AND CONVERSATIONS THIS HAS WITNESSED OVER 150 YEARS PLUS. Great for glass collectors or just Captain Morgan's fans alike. MADE IN A TRADITIONAL TANKARD STYLE WITH A STYLISH HANDLE AND ALL THE APPROPRIATE MARKINGS YOU CANNOT HELP BUT WONDER WHAT SIGHTS AND CONVERSATIONS THIS HAS WITNESSED OVER 150 YEARS PLUS. AGE/CULTURE: 19TH CENTURY/BRITISH. At 7.5" tall it's more like a stein, you'd certainly get plenty beer in. Antique 19th Century Victorian solid silver large and decorative presentation lidded flagon, of tapering cylindrical form on a spreading foot, richly parcel gilt, mounted with a large scroll handle, the sides are profusely embossed with a floral scrolls, a vacant cartouche on each side, beaded borders, the spout is cast as a satyr mask with open mouth. The hinged cover in the same design mounted with a cast lion holding a shield engraved "GUN CLUB LONDON 1895 E.P". Each part is Hallmarked English Silver (925 Standard), London, year 1896 (a), Maker's mark CB (Charles Boyton II, very fine silversmith). Traditional bulbous form in the Georgian style. Assayed: Sheffield, 1937. Bright polished silver finish. Height: 10.5cm. Made from a good gauge of silver. CONDITION: In very good condition. Weight: 190g.